(Newser) – From the front, a half-million-dollar home on the Re/Max website looks like a quaint Spanish Revival in the heart of Seattle. Head to the side for a different perspective, and you'll see appearances are deceiving. You're looking at what Yahoo says locals call the "Montlake Spite House," an 860-square-foot sliver of a house that's legendary even among tiny houses. 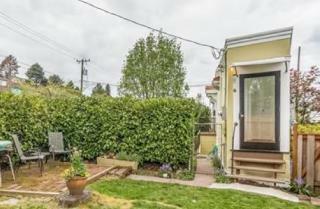 The front of the pie-shaped home built in 1925 is just 15 feet wide, while the back comes in at under 5 feet wide, KOMO reported in 2013, the last time the house was up for sale. Eugene Smith, a retired professor at the University of Washington who wrote a book on area history, says the wedge-like residence "was certainly the oddest of all the bungalows" in the area. "It was the smallest, most peculiar shape," he told KOMO. And the story behind its supposedly spiteful construction is just as strange as its shape. wow! this tiny house is amazing! I have a lake property and they have strict rules on what kind of home you can build. I got the 2 acres on the lake for $1000 from an elderly friend who's wife died ahead of her time so he gave up plans for a retirement home. I pay $50 per month for the HOA which covers water, sewer, fire, and security. On building the home, I had few viable options especially for my pending move to Europe for Hlyliar disaster. So I inquired with the HOA about building a utility shed or garage until I finalized my home plans. They gave me some approved plans for a garage and it pretty much looks like a shed in the back but a cottage in front with a faux facade. I went one step further. I made sure it was large enough for my RV and Rangie. So I permanently installed the RV into it with power, water, and sewer. So when I get there, I press the garage door opener and drive in. I'm good for my brief stay. As far as the HOA cares, its just a garage.